While perusing IG last week, I came across a number of progress shots of a Christmas snowflake block from @rachelwoodenspoon and I was downright smitten. Seriously, go check out her hashtags feed and you'll be smitten too (#christmassnowflakeblock). 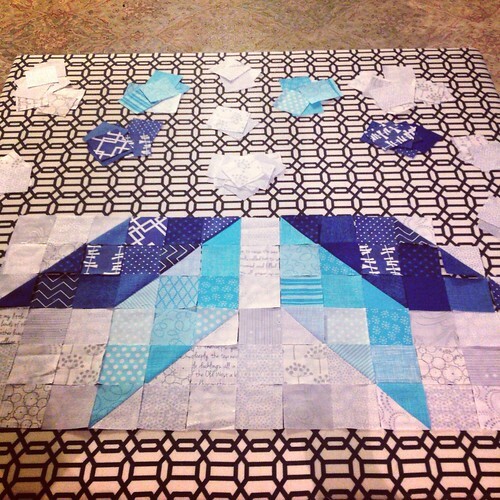 Next thing I knew Lindsey from Thats What Lindsey Made (@thatswhatlindseymade) and I were both on board, starting an impromptu Christmas snowflake block QAL. I chose to go a bit non-traditional and chose two shades of blue instead of red and green like Rachel. I think it adds a nice icy-ness to the block that I'm really loving. Now I just need to choose a centre block colour (open to suggestions!) and between having the dark blue vertical or horizontal. If you're interested in jumping in on an impromptu pillow yourself, Rachel has written a mini tutorial on her flickr page (found here). Yes! Iciness, yes! Baby, it's cold outside! Love this. I love whites and blues together and this just captures the essence of icy cold to me. Great WIP! Argh, my comment vanished. Darn google. I love the blues, not being really into the red/green color scheme. Maybe teal or purple for the middle (if you're not using a blue)? I'm sure whatever you pick will be fab. Gorgeous! Definitely red for the center. 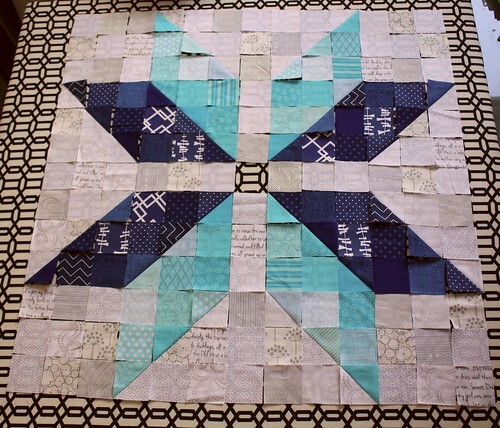 I love this and it gives me an idea of what to do with all the light blue squares I cut up this weekend. Thanks for the inspiration. Cool! Love the background fabrics too. Just gorgeous Kelsey! Love the colours!, and being the bold and colourful person i am, i'd be putting a nice medium grey in the center... perfect! I love this so much! Icy blues are so versatile and you can use the cushion all through the winter. Such a fun pattern! Now just for a few minutes to spare so I can try Rachel's pattern myself. Love the blue for Christmas/winter stuff! 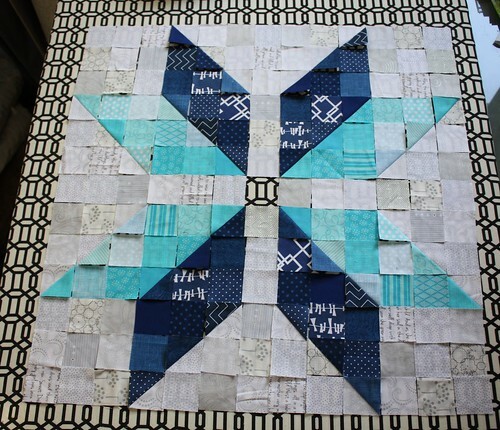 Thanks for sharing about this pattern, I love it!